Any gardener will tell you that buying a quality pair of gloves is essential. It is extremely important for the gloves to fit properly as this allows you to complete your gardening tasks without sacrificing dexterity. Therefore our gloves come in many sizes, catering for a wide range of gardeners. 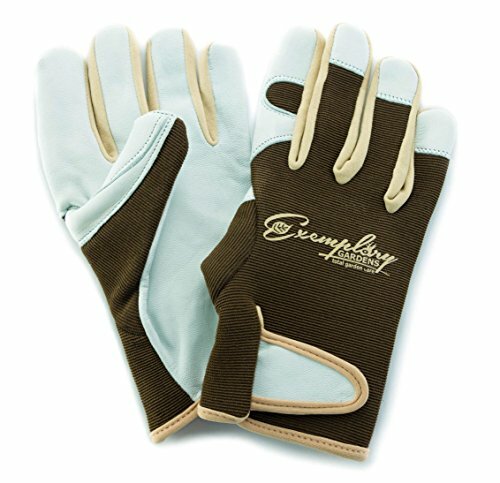 Exemplary Gardens Gardening Gloves are a premium quality product. The palm of the glove is made out of carefully selected goatskin leather. The spandex back allows your hands to breathe, and this combined with the fastener makes it possible for you to remain comfortable and spend hours in the garden! Please scroll up and click on the image titled "How To Measure Your Glove Size" to buy the correct size. We proudly stand behind our 100% Satisfaction Guarantee. If you are not completely happy with your purchase, we will offer you a full refund. CLICK "ADD TO CART" NOW TO SAVE YOUR ARMS FROM ANY FURTHER TORTURE! Adjustable fastener and breathable spandex back allows for a nice, snug fit. This allows you to maintain dexterity while planting, weeding, etc. Genuine goatskin palm and fingertips offers extra protection in sensitive areas. This prevents sharp thorns from piercing through. Beautiful unisex brown color allows you to garden without dirt showing on the gloves. Keep hands and fingernails clean as well as safe with a luxurious pair of garden gloves. Risk free due to our 100% satisfaction guarantee. If you are not happy, simply return the product for a full refund. If you have any questions about this product by Exemplary Gardens, contact us by completing and submitting the form below. If you are looking for a specif part number, please include it with your message.